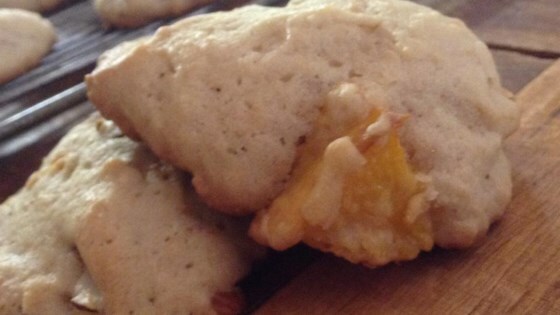 "Basic, fluffy sugar cookie with fresh peaches (made out of desperation because my family had so many peaches from our trees!)." Preheat oven to 325 degrees F (165 degrees C). Grease a cookie sheet. Beat shortening and sugar together. Blend eggs and fruit into the shortening and sugar mixture. Stir flour, salt, baking soda and nuts into the egg mixture; mix well. Drop dough by teaspoonfuls onto the greased cookie sheet. The cookies will double in size while baking, so set the cookies far apart on the cookie sheet. Bake for 12 to 15 minutes. Really good! I didn't peel the peaches and I pureed them for a more even texture! wonderful cookie! delicious, moist, and doubled in size as mentioned. better than regular sugar cookies. As stated by others they are too soft and not much peach flavor. Maybe next time I will cut back on the shortening and add more peaches.